These printable geometry worksheets will help students learn to measure angles with a protractor, and draw angles with a given measurement. Visit the Types of Angles page for worksheets on identifying acute, right, and obtuse angles. Measure twelve different angles with a protractor. On these task cards, students will use their protractor to measure angles. File includes 30 cards and an answer page. Draw each angle with a protractor. Measure the angles using the protractor. All angles face right. Measure the angles using the protractor. Angles face right and left. Use a protractor to measure the angles. All angles face right. Use a protractor to measure each of these angles. Angles face right and left. Measure each of these angles with a protractor. All angles face right. Measure each of these angles with a protractor. Includes both left and right facing angles. Measure each the angles with a protractor. Angles spun in all different directions. This worksheet has pictures of pairs of adjacent angles. 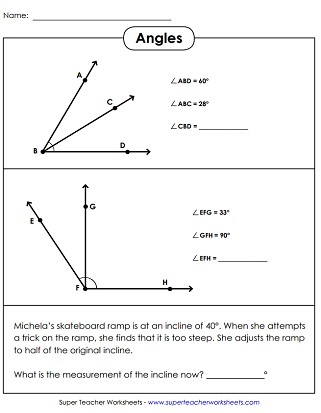 Students should recognize them as additive and find the measurement of the missing angle. Solve two word problems that require addition of angles. Need protractors for your students? Print this page on heavy card stock. 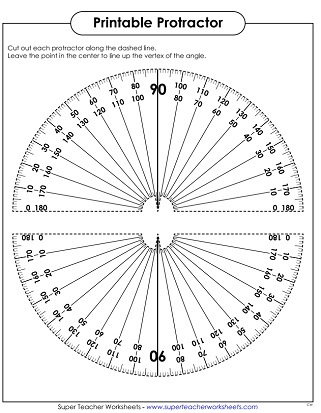 Students can cut them out and use them to measure and draw angles. 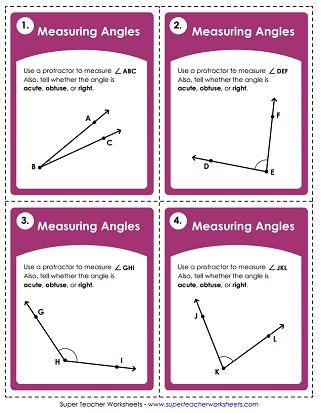 This page has printables to help students identify types of angles. Most cover acute, obtuse, and right angles. A few also cover straight and reflex angles. This page has worksheets for teaching students about complementary angles (angles whose measurements add up to 90 degrees) and supplementary angles (whose measurements add up to 180 degrees). Shapes, lines, perimeter, area, symmetry, radius/diameter, and flips, slides, turns, and more.